Ready to eat. Consume soon after opening. Allergy Advice: Contains Mustard, Soybean. 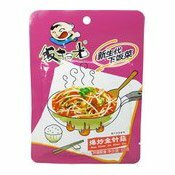 Ingredients: Enokitake (Mushroom) (26%), Stem Mustard, Soybean Oil, Lettuce, Chilli, Dehydrated Mustard Leaf, Cowpea, Ginger, Salt, Garlic, Sichuan Peppercorn, Spice, Flavour Enhancer (E621), Yeast Extract. Simply enter your details below and we will send you an e-mail when “Spicy Enokitake Mushroom (Bao Chao Jin Zhen Gu) (飯掃光爆炒金針菇)” is back in stock!